4.1 Faults & Fixes Got a problem with your RAV4.1? Share it here and maybe even find a solution. We have a 99 Rav, manual transmission, 250,000 miles, runs GOOD, no oil use. The last two times emissions test, it just barely scraped through after fresh oil, full warm up (hot! ), high tire pressure, etc. New oem cats are $$$!, and it doesn't seem there are others available. Any ideas, especially how to get a qualified cat or any other ideas ??? what component of the test was close to a limit? Look the catalytic converters up on Amazon.com there are several for the 99 RAV4. In 2008 I battled to get my 17-year-old 1991 Civic to pass emissions. I finally put on an aftermarket catalytic converter, and it passed. The next year, it failed emissions. I did massive troubleshooting but could not get it to pass. I was not going to buy yet another catalytic converter. I ended up selling the Civic to someone in a town with no emissions requirements. I think the expense of trying to get some older vehicles to pass emissions may not be worth it. Where do you live? 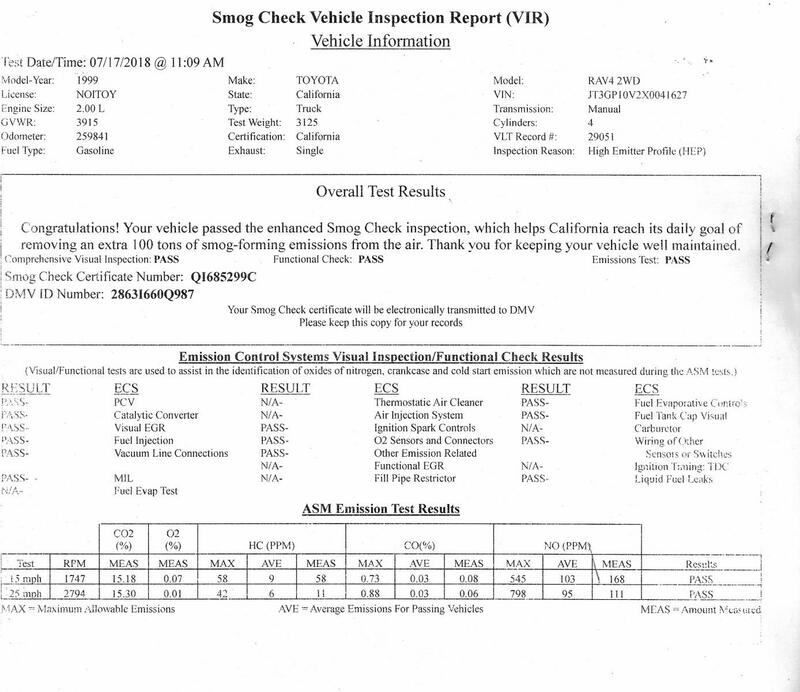 Scan and post your emissions test results and maybe we can help. You can also clean a catalytic converter, I have done this and it works as long as the cat isn't physically damaged or that the catalyst isn't damaged. I remove the cat and then soak it overnight using dawn dishwashing detergent (completely submerged), then I rinse it out well. It doesn't always work but if it's failed because it's getting clogged or has been contaminated with oil coming from the engine it can fix the problem. And, if you do have to replace it, now at least it's easy to get off. Automatic cats are easy. Manual cats are not. California is not. Now a car passes emissions in CT based on no OBDII codes so it's easy to know if it will, but back when they sniffed the exhaust I've used run the car a couple miles in a low gear to heat up the converter real good. That often woke it up temporarily enough to pass. If I read your results accurately, the only problem I see is high HC PPM at 1500 RPM. This would have nothing to do with the catalytic converter. High HC at idle is often a lean fuel mixture - This is usually caused by unmetered air entering the intake manifold, and ultimately the combustion chambers which will cause high hydrocarbons (HC). This condition is called a lean miss-fire. Such faults as vacuum leaks and gasket leaks will cause lean fuel/air mixtures. Inspect your airbox that it isn't cracked or have holes and is sealed correctly. If any of the latches are missing, broken, or damaged, it won't seal properly. Inspect that the intake air lines are properly connected and sealed. Inspect the seal for the Air Temperature Sensor (IAT). Inspect the air intake system between the air filter box and the throttle body. There can be no holes or cracks that would allow air to flow into the air intake. Other less likely problem areas, intake manifold gasket leak and throttle body to intake manifold leak. Check these areas if after doing everything else you still have a problem. Usually, you will only have a problem here if the manifold or throttle body have been removed and not reattached properly. BARO/Manifold Absolute Pressure Sensor (MAP) The map sensor detects the vacuum pressure created inside the intake manifold of the vehicle and sends the engine load information to the ECM. The ECM will adjust the fuel injectors pulse width accordingly. See Sensors, their descriptions and symptoms. Sometimes this will throw OBDII code. This is a different issue but it can have the same symptoms, a dirty/clogged Idle Air Controller Valve (IACV) - clean the valve and hose, see Sensors, their descriptions and symptoms. Often this will throw OBDII code . Last edited by eodgator; 04-05-2019 at 07:03 PM. Reason: Add material, clarification, spekking, I mean spelling. I understand and agree with most of this. However, with the problem actually occurring at high vacuum, I would think that the leak would be located somewhere between the throttle plate and the engine. This is reinforced by the situation two years ago where the problem actually got a bit worse when I increased the tire pressure, giving lower rolling resistance, lower throttle setting, and higher manifold vacuum. All this brings back to memory a mention from the shop where some work was done maybe 3 years ago that the butterfly shaft was a bit loose. Of course I'll check the easy stuff first, but... Is this a common thing on this vintage Rav ? I haven't time tonight to do a long search, but I don't quickly find any that fit this car on line, and those that I do find are $500 or so and up. Can this be easily fixed on the existing unit, seals bearings, or any other clever device?